Hi world! 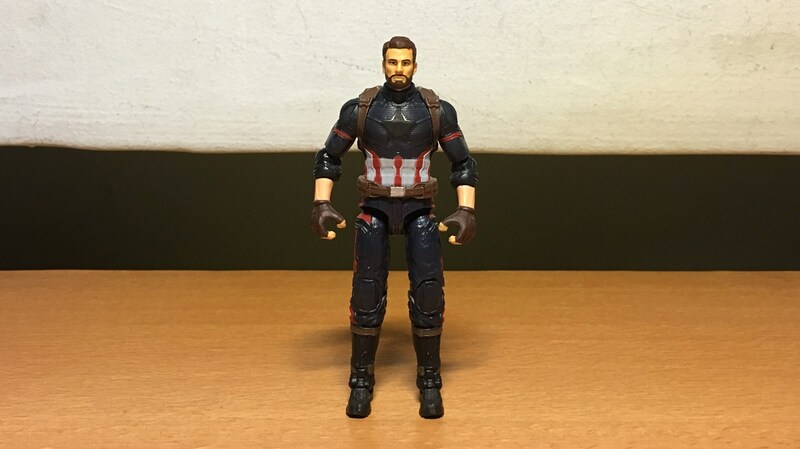 Here’s another custom figure from the Marvel Cinematic Universe – Captain America, as based on his appearance in “Avengers: Infinity War”. Unwilling to subject himself to the Sokovia Accords, Steve Rogers goes on the run. After sending his friend Bucky to Wakanda for medical treatment, Steve Rogers joins up with fellow fugitives Falcon, Black Widow, and Scarlet Witch, together they work off the grid as Team “Secret Avengers” and continue the fight against formidable global threats, in one instance thwarting a terrorist cell from obtaining deadly Chitauri weaponry. Head – A cast of Steve Rogers’ head, originally made from this Captain America variant. In “Avengers: Infinity War”, Captain America wears a slightly modified version of his suit from “Captain America: Civil War”. 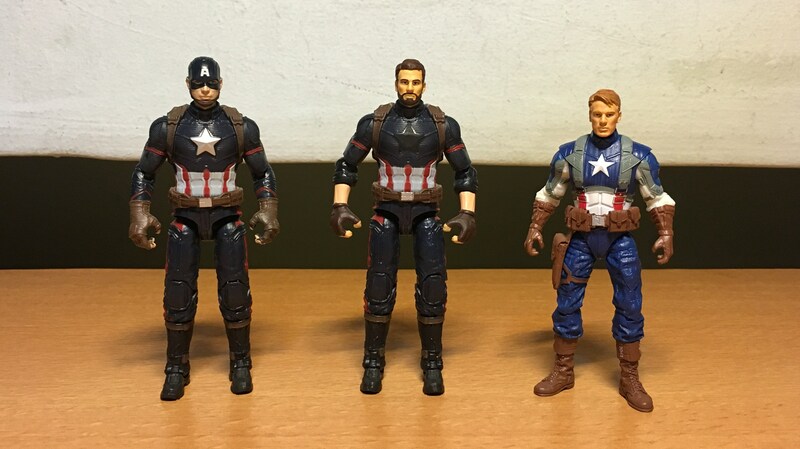 I decided I could customize a A:IW Captain America by using the “Civil War” Captain America as a base. The star on the chest was sliced off, with the empty space painted black. True Heroes Barracuda had rolled up sleeves and gloved hands that somewhat resembled A:IW Capt’s. Indiana Jones elbows were used as the pegs fit nicely with the upper arms. A combination of superglue and epoxy putty was used to replace the elbows, with epoxy putty sculpted to match with the rolled up sleeves. The Steve Rogers cast head was bought on eBay and slightly modified to match the A:IW Capt’s hairstyle, while the beard was sculpted on using epoxy. Or if you really feel rich enough, you can track down the extremely rare Captain America variant and use the head for the custom. 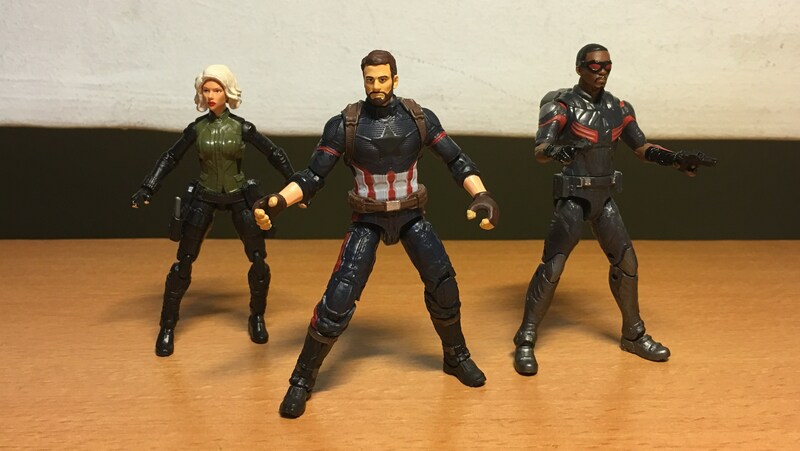 Team “Secret Avengers” – Black Widow, Captain America, Falcon. Scarlet Witch was having a time out. 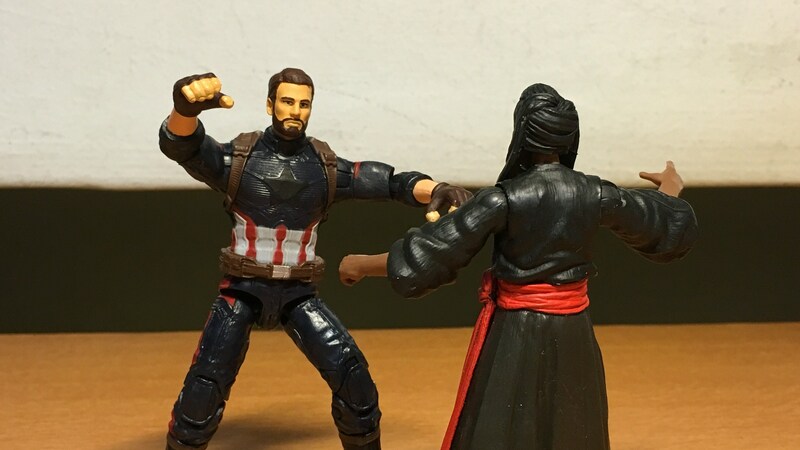 Later on at the Battle of Wakanda. 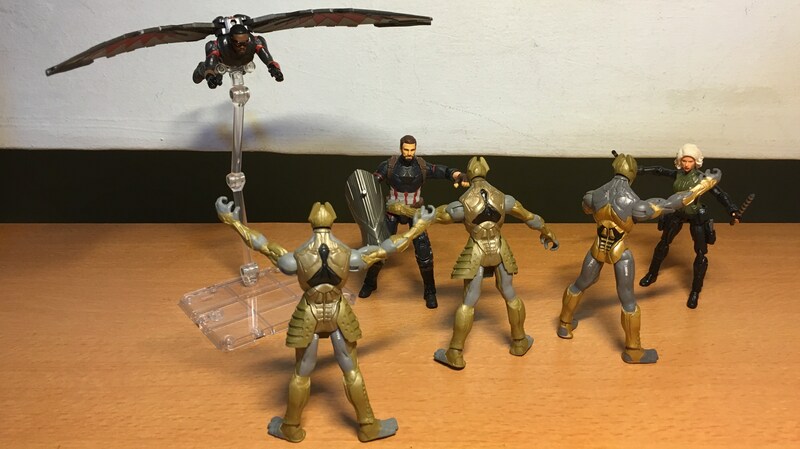 Since there aren’t any Outrider figures available, the Chitauri are standing in for them. The onscreen appearances of MCU Captain America. 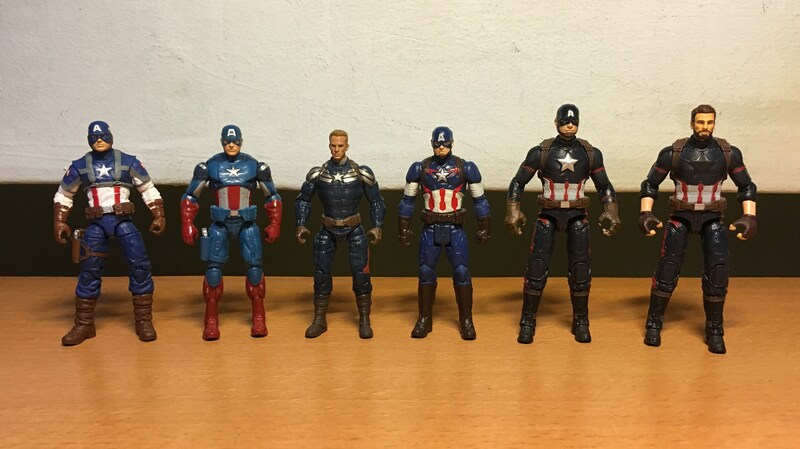 From left: “Captain America: The First Avenger”, “The Avengers”, “Captain America: The Winter Soldier”, “Avengers: Age of Ultron”, “Captain America: Civil War”, “Avengers: Infinity War”. Sorry S.T.R.I.K.E. 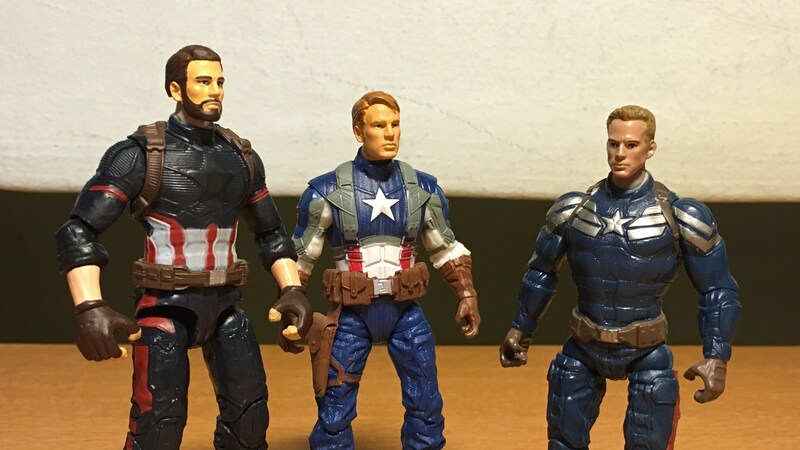 Team Captain America, but your supposed likeness to Chris Evans is of serious suspect. You may just work for a Johnny Storm though.